With the right relationship between development team and leadership you can dramatically improve your ability to create good products quickly. To understand this relationship, and how the Scrum Team and the various Scrum roles should interact with the rest of the organization, let's look at two examples of modern train systems: the DLR in London and the TGV in France. I came to understand the relationship between the product and the team while riding on the DLR to the Scrum Gathering in London last year. 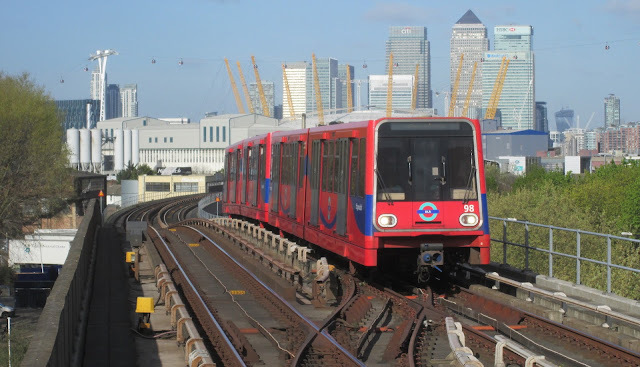 The Docklands Light Railway (DLR) connects downtown London with London City airport, Canary Wharf and other important destinations. This train is amazing! You walk into the station, flash your credit card at the entrance – beep – you can enter! Walk to the platform and a display tells you to the minute when the train will arrive. The train pulls in, doors open, people get off, you get on, the doors close, and off the train goes. This cycle repeats a few times until you get to your destination. Doors open and you get off, flash your credit card on the way out (half the price of a paper ticket) and you are done. No human intervention from start to finish! I thought, 'Wow, if there is an example of what you can accomplish in the 21st century, this is it!' But… what is it like to actually ride in the DLR? The dinosaur ride at Disney World comes to mind. Bump, shake, lurch, rattle, roll…. Take a look at the track in the picture above. See that dip? If that were on a ski slope, you would go airborne! See the sharp angle changing tracks? You feel every junction and turn, and it can't go very fast through such a sharp angle. While I don't know if this is literally true, it sure feels like they haven't maintained the track since the DLR opened in 1987, and the average speed of the DLR train is under 50 km/h. Now let’s look at a high-speed train like the Paris to Amsterdam TGV: we see smooth, flat tracks, limited radius curves and other optimizations for high speed operation. And a pleasant side effect is a smoother ride. This train can provide service at 300km/h. How does this relate to your Scrum team? As a Scrum Master (or other leadership roles outside the Scrum Team), your focus is on creating the high speed “track,” that highly optimized environment that enables information to flow rapidly and effectively, so that your teams can build great products quickly! The Scrum product owner and other product management functions are focused on what to build; the Scrum Master and other leadership on enabling everyone to work effectively. In an agile company, leadership fixes impediments to performance and improves the organization's ability to deliver value over time. How important is it to fix impediments? On certain segments, this TGV is only capable of 200 km/h, because the track only has enough power for that speed. Like with the TGV, if leadership would fix the impediments, the teams could go much faster. What is the easiest way to achieve this? To have a leadership team that has a vision for the organization and uses Scrum to manage its work of fixing impediments and implementing the vision. Depending on the scope of the team and its mandate, this might be called the Impediments Resolution Team, the Departmental or Enterprise Transition Team, or even the Enterprise Action Team if the top leadership of the organization is involved. Regardless of the scope, their job is to take care of the track. Who is in this team? Assuming you are transitioning a department, then the Team Leaders and Scrum Masters or other process coaches will be members of the team. The top manager of the department will probably be Product Owner, because this person has the authority to make changes in that department. The key to success is that the Scrum Masters and the traditional managers see themselves as part of one team whose common goal is to improve their part of the organization. Unlike the weekly status meetings, where the status of many issues gets discussed, but problems get solved slowly, the “IRT” (or whatever you call this team) uses Scrum to focus on and solve a small number of issues at every cycle. Just as your developers get better at getting features done using Scrum and delivering, the Impediments Resolution Team gets better at addressing issues that slow down the organization. You give your leadership and management the same high performance framework that you give your development teams. Your “track” can match the potential of your trains. You connect the production teams directly with the leadership team, so information flows quickly and effectively up and down the organization. You lead by example. By making agility something you do at the leadership level, rather than something you tell your staff to do, you set an example that others will happily follow. You reduce the uncertainty and fear around transitioning to an agile approach, which makes it much more likely that you will succeed!